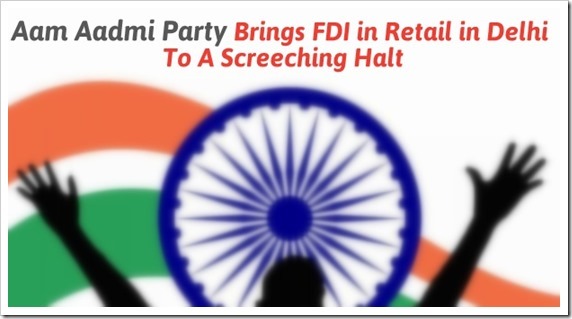 Arvind Kejriwal Brings FDI In Retail Sector In Delhi To A Screeching Halt! The business of politics and the politics of business; both are very interesting subjects. But when it comes to actual implementation of either of these in actual life, then things can go pretty nasty. Last month, we had celebrated the victory of Arvind Kejriwal as he defeated three times CM Sheila Dixit in Delhi. It was a symbol of new hope and a new beginning. Around the same time, we had reported that Government has now allowed major changes to FDI policy, as unlisted Indian companies can now list themselves in foreign stock exchanges. And, we had also shared with you the news that TESCO, world’s second largest retail chain is finally opening its stores in India. Under Sheila Dixit, Delhi too had agreed for FDI in retail sector, and things were looking progressive. But yesterday, Aam Aadmi Party, the ruling political party under Arvind Kejriwal has written to Department of Industrial Policy and Promotion (DIPP) stating that Delhi will no longer be host to FDI in retail of any kind. A screeching halt to the development and progress which we were expecting to happen in Delhi. It shouldn’t come as a surprise to us, as AAP was against FDI right from the start. In their manifesto, it was clearly mentioned that if they come to power, FDI would be scrapped and multi-national retails won’t be allowed to operate in Delhi. The problem with this populist decision is not just that Walmart and Tesco won’t be able to open their shops in India, but it’s bigger. Such decisions will have a ripple effect on the overall foreign investment scene inside India, as investors based in US and Europe would now be super-conscious on their expansion plans within our country. There are several advantages as well as disadvantages to multi-brand retail and single brand retail opened by multinationals. We as consumers will definitely get benefited and we as farmers will get some additional advantages. We as kirana-store owners may get some less business, and we as small scale businessmen may get threatened by billion-dollar biggies in this sector. But, governments should not think entirely from the point of view of populist decisions and pleasing the mass. The growth and development of the country with the assistance of FDI can be made good, and can be a major catalyst in the overall development of the country. We hope that politics and business are not inter-mixed, and we get some good decisions, for the betterment of all. Editor’s (Arun’s) Views: AAP’s sudden ban on FDI in Delhi sets a precedent for other states as well. What this means is, if Government changes in any of the other states, they are free to immediately overturn the decision. The policies passed on FDI previously will have no meaning if new state govt decides to not honour it. Foreign investors are obviously watching this and I am sure they will now be even more cautious before putting their monies. From national economy’s perspective this may turn out to be quite a damaging decision! We have a lively discussion on Facebook in this regards, you can follow it here. Local Sourcing Norms Relaxed, Flood Gates Open for Apple, LeEco & Xiaomi! Govt Approves 20 FDI proposals, Singapore Airlines Gets Nod!